﻿ Fast Train Cargo Limited. 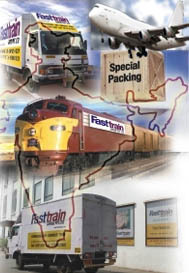 is a 19 year old organization founded by our Director Mr. Nitin Somani who had started a specialty Transport Company by the name “Fast Train Cargo” since 1990 which is dedicated in providing the best Transportation, Forwarding & Clearing Services al over India with 42 Depots and a Dedicated, qualified staff of 450 employees. © Copyright Fast Train Cargo Limited., 2008-09. All rights reserved.